Many Americans believe Lincoln wrote the speech on the back of an envelope while riding the train to Gettysburg. This charming piece of fiction originated in Mary Shipman Andrews’s 1906 book, The Perfect Tribute. Two of Lincoln’s autograph manuscript drafts of the speech survive. Based on Lincoln’s schedule and the paper trail, historian Gabor Boritt concludes that Lincoln wrote the first part of the first draft in Washington and finished it that evening in Gettysburg. Boritt also concludes that Lincoln quickly wrote the second draft the next morning. The second draft may have been Lincoln’s reading copy, as it is closest to the words captured by reporters at the scene. Lincoln surrounded himself with the press corps, reflecting the rise of news reporting as big business with the advent of the telegraph. Early Lincoln scholars thought that there were only four reporters on the scene, (Associated Press and New York Herald reporter Joseph Gilbert, Boston Daily Advertiser reporter Charles Hale, and reporters from the Chicago Tribune and Philadelphia Enquirer), but we now know that there were at least 23 additional reporters there, including many of Lincoln’s allies in the Republican press. Known as “Lincoln’s dog,” Lincoln supporter and Philadelphia Press owner John Forney offered a pro-Lincoln rant the evening before the speech. Despite his intoxication, he was sober enough to wait for the slew of correspondents to arrive to take down his words. The New York Herald received the Associate Press text by telegraph and published it the next day. More Americans learned of the speech through the AP text and its variants than any other source. When Lincoln penned his later copies, he was said to have referenced the AP report. Detail from The World, New York, November 20, 1863, with the Associated Press version. The text of the AP version and its slight variants (usually punctuation and capitalization) are easily identifiable by the use of the phrase “to the refinished work” instead of the more appropriate “to the unfinished work.” The AP version also omitted the word “poor” in the line “The brave men living and dead who struggled here, have consecrated it far above our [poor] power to add or detract” even though multiple eyewitnesses recorded it and it was present in both of Lincoln’s manuscript drafts. In addition to the “poor” omission, the phrase “We are met to dedicate” is “We have come to dedicate” in Lincoln’s written copies. Moreover, Lincoln must have extemporaneously added “under God,” which he included in versions he penned after the fact. Headlines from the Philadelphia Press, November 20, 1863. 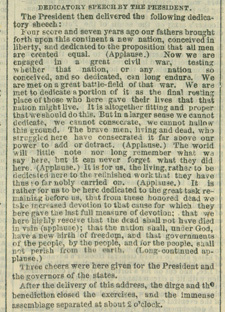 Neither the Boston Daily Advertiser nor the Boston Evening Transcript used the AP’s text, because both papers correctly quoted Lincoln as saying the nation had “unfinished work” instead of the AP’s “refinished work.” However, it appears that the Evening Transcript used some of the morning paper’s copy, because while correctly printing the much more sensible “forget” in place of “forbid,” the afternoon paper still left out the word “little” in exactly the same place. Other than that, the text from these two competing newspapers is nearly exact, except for a few commas. Ultimately, the speed with which first-day printings were produced, as well as the vagaries of nineteenth-century communications, produced many slightly unique versions of Lincoln’s words. What has come down as the standard version of the Address was compiled from Lincoln’s drafts, reports of what he spoke at the time, and later revisions made by Lincoln himself, who kept tinkering with the text. In the year after the speech, he wrote out three additional versions for charitable purposes using the newspaper reports and his own drafts. The Edward Everett copy was intended as a fundraiser for the New York Metropolitan Fair and is now at the Abraham Lincoln Presidential Library. George Bancroft requested a copy to lithograph and sell at the Baltimore Sanitary Fair. Lincoln agreed, but his first attempt (today known as the Bancroft copy) lacked both a title and signature, and ran into the margins. It is now in the collection of Cornell University. Because its lack of margins made it impractical to reproduce, Lincoln penned a second copy with both title and signature. This, known as the Bliss copy after Bancroft’s stepson, is at the White House. All three of these later copies more closely approximate the words that Lincoln actually spoke at the cemetery dedication. What is now considered the standard text in history textbooks and on the wall of the Lincoln Memorial is the last copy—the Bliss version—with slightly different comma placement. 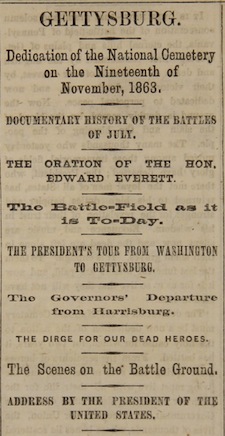 Visit our website to see rare copies of first day of publication newspapers and other documents and artifacts relating to Lincoln and Gettysburg. 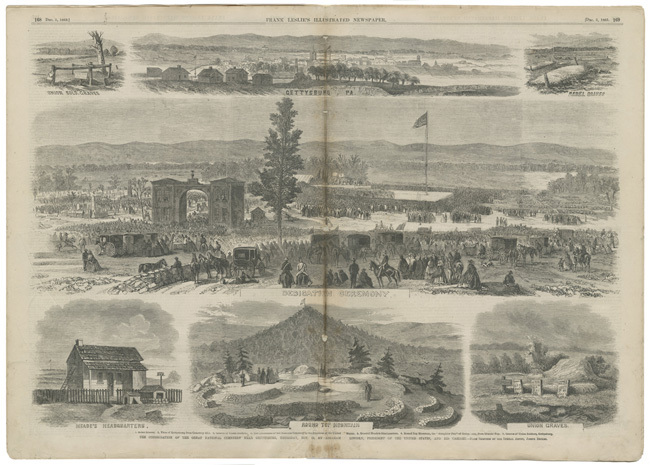 Engravings of the battlefield and dedication ceremony, from Frank Leslie’s Illustrated Newspaper.